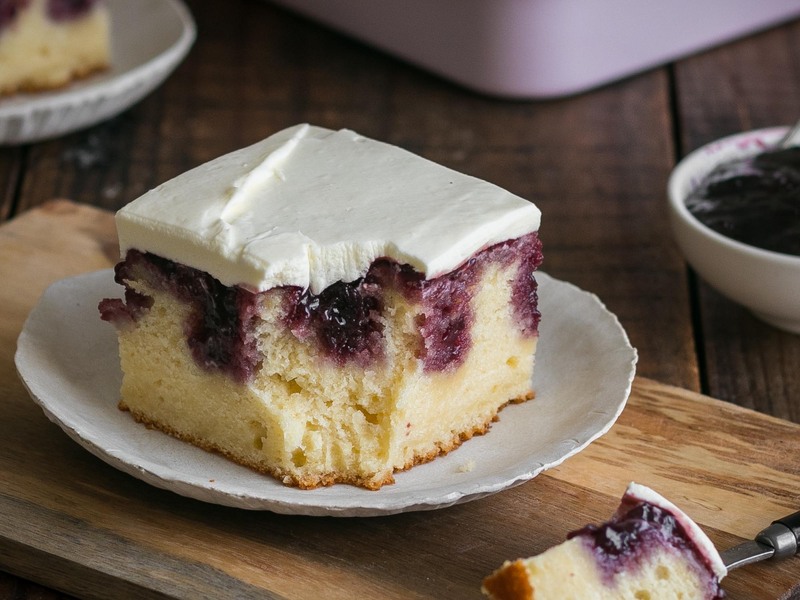 I love the combination of jam and cream so when I started working on this recipe for the Barker’s Pantry website, I knew I wanted a cake that had these elements. I’ve provided a recipe for a butter cake but for a quick version, you could use your favourite boxed cake mix . With this cake, it’s really important that the milk, sour cream/yoghurt and eggs are at room temperature before trying to start baking. The butter only needs to be softened (definitely not melted) to be creamed with sugar. It’s much easier to cut this cake when it’s been refrigerated for a little while so that the stabilised whipped cream has a chance to set and make sure to clean the knife in between each cut. Preheat an oven to 180 degrees Celsius. Grease a 19cm square pan with butter and line the base with non-stick baking paper. Add the vinegar to the milk and set aside for 5 minutes. Whisk in the vanilla extract and sour cream (or yoghurt). Place the butter and sugar in to the bowl of a stand mixer. Using a paddle attachment, cream the butter and sugar for 3-5 minutes or till it’s lightened in colour and fluffy. Scrape down the sides of the bowl and with the mixer running, add one egg in at a time, making sure each one is well incorporated. Using a spatula, fold in 1/3 of the flour into the butter mixture until the flour is just incorporated before adding in 1/2 the milk and folding that in. Keep alternating till all of the flour and milk has been add. Don’t over beat the mixture. Pour the batter into the prepared cake pan and bake in the oven for 30 minutes – a toothpick should come out clean when inserted into the center of the cake. Sit the pan on a baking rack for a few minutes. During this time mix the Barker’s New Zealand Boysenberry Jam with 3-4 tablespoons of water. Use the end of a wooden spoon to poke holes evenly all over the cake and spoon the jam all over the top of the cake, making sure to push the jam into the holes. Allow the cake to fully cool down either on the bench or in the fridge. When you’re ready to finish the cake, mix the gelatine and two tablespoons of water in a small saucepan and set aside to allow it to bloom. After 5 minutes, heat the gelatine mixture over low heat till the gelatine fully dissolves – don’t let it come to a simmer. Let it cool for a few minutes to room temperature before using. Start whipping the cream with the icing sugar in a stand mixer and once it starts to thicken, pour the gelatine mixture in as the stand mixer is running. Whip the cream till it reaches stiff peaks. Spread the cream all over the top of the cake. Refrigerate the cake for an hour to let the cream set before slicing the cake. It’s easier to slice the cake straight out of the fridge but it’s nicer to leave it for 30 minutes before serving.